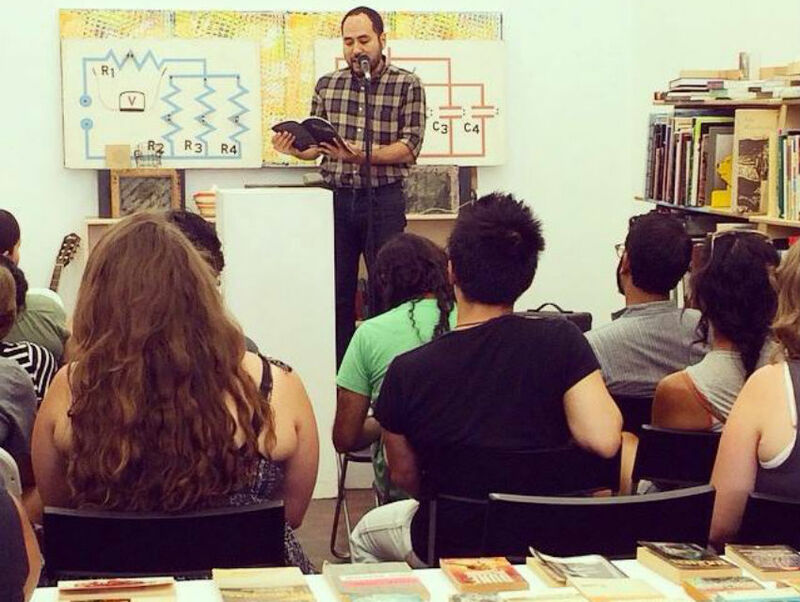 The Sumarr Reading Series, founded in 2010, is a staple in Los Angeles’s literary community. Sumarr takes its name from Norse mythology and refers to the personification of summer. Events take place on Sunday afternoons throughout the season at Pop-Hop Books & Print in Highland Park, with each featuring four to five readers and a musician. Past performers include Douglas Kearney, Hannah Gamble, and many other mostly Los Angeles-based artists. You can keep up with the Sumarr Reading Series and read about upcoming events at their Facebook page. We spoke with poet, founder, and curator of Sumarr, Diana Arterian, about the series and what literary delights this year’s calendar has in store. What motivated you to start Sumarr? When I was getting my MFA at CalArts I found I wanted to give my peers the opportunity to read to people. And I wanted to read to people but didn’t have enough connections in the literary world to do that very often! Sumarr has also had a musical component for a long while. I went to USC as an undergrad and started out there in the music school, mostly hung out with jazz heads and kept in touch with a lot of them over the years. So I had these two communities, though relatively small at the time, and I loved the idea of music and literature. The events were very very informal at first. Really friends just reading to friends, with the wonderful poet Nick Katzban spinning vinyl and us drinking beers and dancing on concrete in my backyard. What goes into crafting the program? By and large I’m interested in providing a platform for writers of all kinds, and I’m particularly motivated to have authors who are different from myself (whether it be sexuality, color, aesthetic, etc.). I often invite authors whose writing isn’t for me, but I know it is important and/or trust the quality of the work. I make sure to include those voices. Going to a reading series where everyone looks and sounds like the curator (especially if that curator is a privileged member of society) is not what I want as a listener or as a politically minded citizen in the literary world. What are your goals for Sumarr in the future? To get more people who I don’t know personally but whose work I admire to come and read. Same with musicians. I would also like to have people come consistently to the readings in good numbers. Some events I’ll have 40 people show up. Others, 10. Though I’ve been doing this for five years, I’m still tweaking the curation aspect that involves ensuring many different friends and supporters will be there to listen. That said, there is something lovely about the intimate events as well. What can we look forward to at this year’s events? I’ve come to learn about several amazing writers who are in the L.A.-area I didn’t otherwise know about. Margaret Rhee, Hannah Sanghee Park, to name a couple. I’m thrilled they agreed to read. One event I’m particularly excited about is the very last one of the 2015 season on September 27. We’ll be celebrating three book launches by friends of mine (Marci Vogel, Corinna Schroeder, and Robin Coste Lewis). The equally incredible Elizabeth Hall will also be reading. It’s going to be so amazing. They are four knockout writers. Future readers include Jibade-Khalil Huffman, Collier Nogues, Erica Mena, Ashaki Jackson, Andrew Choate, Allison Carter, and Aaron Kunin. Music from MRK, Elephants with Guns,and Lilacs. The season has been thrilling so far, and I’m just as excited about the upcoming events. What writers/musicians do you dream about featuring? Really the most exciting ones for me are those who happen to pass through town. I just had Hannah Gamble read this past weekend and that was such a treat. Otherwise, perhaps they are the obvious L.A. all-stars who I’m afraid to ask to participate this go-round: Maggie Nelson, Claudia Rankine, Anthony McCann, Sarah Shun-Lien Bynum. Brian Evenson just moved here to join the CalArts faculty, so that would be amazing to have him. As for musicians, I’ve been very lucky to get connected through my readers to all kinds of groups and solo performers. I don’t think I know enough about which musicians live in L.A. to even dream. Mostly I’ve been enjoying the lovely surprises of the talented musicians that come my way.